Nobody likes waiting to speak with a support agent when they’re dealing with technical issues like, say, network jitter. From the automated routing messages to the random disconnections, it’s likely not something you look forward to. That’s why it can be helpful to know some basic steps to take when your VoIP phone is experiencing issues. Troubleshooting first allows you to cut some potential problems early on. Even before having to reach out to a tech support representative. Here, we’ll cover 5 of the most fundamental issues that can occur with your VoIP phone system. VoIP problems can involve networking or Internet connectivity issues. They can also include security problems and issues involving related devices. You can follow these steps in order and use the process of elimination to determine which issue needs fixing. Networking and local area network (LAN) issues usually involve problems between personal computers or the equipment that connects them to the Internet. This is often a router issue. Either the router is malfunctioning, or you have the wrong router for VoIP technology. When using VoIP, you’ll need a router that prioritizes calls through the Internet. Without a VoIP-prioritized router, you may experience call quality issues if others are using your bandwidth. This may seem obvious, but the first thing you should check is your equipment’s wiring. Ensure all hardware is plugged in correctly. Next, unplug all power cords, leave them out for 10 seconds and then plug them back in. Wait for all the lights to turn back on. This will give your router and networking equipment a fresh start and clear any basic issues they may be experiencing. This means checking if your router has VoIP QoS (Quality of Service) settings and, if so, making sure they’re enabled. While every router is different, most QoS settings are in the router’s management interface. Depending on the brand, you can Google “[Router Brand] VoIP configure QoS Settings” and should find a step-by-step tutorial. This QoS troubleshooting guide is a great place to start. If your router doesn’t have a QoS feature, you may need to look into port forwarding. To do this, you’ll need to know the MAC address of your phone — this will vary, but is usually found on the back of your phone or by navigating the phone’s on-screen menu. You can then assign a port to the router through the device’s internal settings menu. Again, this will vary by router, but you can find a list of port forwarding instructions for various routers here. If reconfiguring your router settings doesn’t work, and you’re still experiencing router issues, you may need a new router. Upgrading to a dual-band router can significantly improve your VoIP experience. Dual-band routers are capable of transmitting on different frequencies. This way, users can assign each frequency a different task. You can assign VoIP communication a dedicated channel. Also, we just updated our VoIP router buyer’s guide. Get the best VoIP router from this list! If you’re sure all your networking equipment is working correctly, you can look into other reasons why your VoIP service isn’t functioning properly. If you’re experiencing phone and voice quality issues, it’s important to rule out reasons such as call volume, interference and faulty phone equipment. Cover your phone’s mouthpiece. If the echo, buzzing or interference stops you may just need to turn down the volume of your earpiece or speakers. Move your router. Keep the router away from your computer monitor, CPU and power strip. They could be causing interference by being too close. Check any intermediary equipment. Bypass any splitters or caller ID devices connected to your router and phone. This means to take any third party equipment out of the equation by plugging the router and phone directly into one another. If the problem ceases after you bypass a certain piece of equipment, it’s likely that piece of equipment is faulty. Check for old equipment. If you’ve had certain equipment like a headset, microphone or the phone itself for a long time, it may need an upgrade. Old equipment can sometimes result in poor voice quality. Another common set of problems that can cause an array of issues is wide area network (WAN) or Internet connectivity issues. These include issues that aren’t necessarily contained within your vicinity or equipment. This includes trouble with your Internet service provider (ISP). Some Internet bundles are for web surfing and streaming but aren’t powerful enough to use VoIP. Transporting voice packets is essential for VoIP calling. It requires an additional set of Internet protocols that your ISP may not be providing. Before you begin VoIP troubleshooting, ensure you have a “business class” Internet bundle that supports VoIP usage. Nextiva has an easy-to-use speed test to determine if your network is VoIP-compatible. Your speed will determine how many VoIP phones your network can handle. You can use this handy chart to interpret your speed test. Before performing the test, ensure you plug your computer in directly to the modem. Packet loss is a condition where data packets are transmitted correctly from one end of a connection, but fail to make it to their intended destination. This is usually caused by bad network conditions or Internet congestion. VoIP connections are dependent upon data packet transmission. Therefore, even a small amount of packet loss can result in VoIP communication issues. 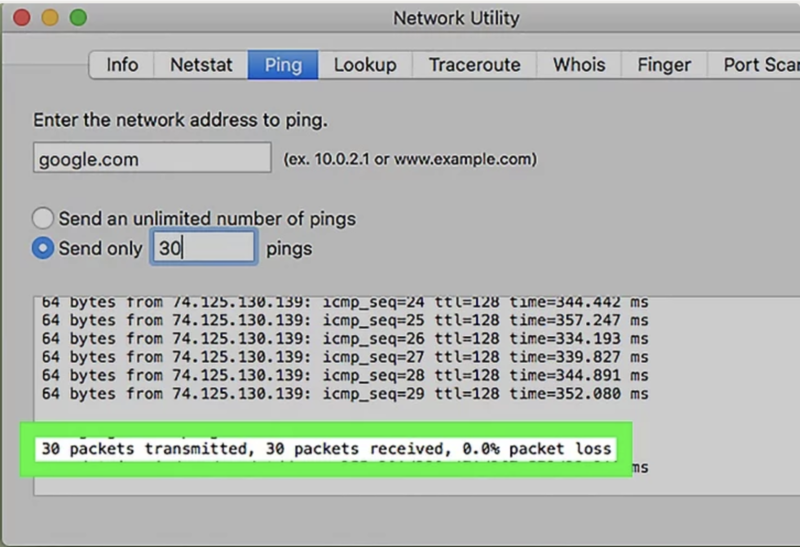 To find out if you’re experiencing packet loss you’ll need to run a ping test. You can learn all about how to run a ping test here. As you run the tests, document your results so you can give them to your Internet service provider if necessary. If you’ve looked at your LAN, connectivity and equipment and determined that the issue is with your WAN, you’ll likely need to call your ISP. They can help you determine if there’s an outage in your area or help you troubleshoot your Internet connectivity issues. Since VoIP is connected to the Internet, it’s susceptible to virtual attackers and cybersecurity threats. Security issues can not only affect your call quality but can put your personal data at risk. That’s why if you suspect you’re having issues that involve your VoIP security, you should look into correcting them immediately. VoIP calls can be hacked, which means that it’s possible for third parties to listen in on your calls. If you suspect your password information has been compromised, reset all passwords. Use strong passwords that contain letters (both capital and lowercase), numbers and symbols. 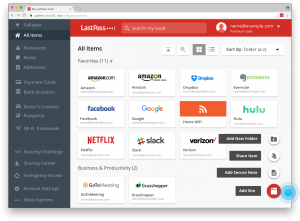 It’s smart to encrypt these passwords somewhere safe using a password encryption software like LastPass. It’s possible for the VoIP admin to deploy a firewall for your VoIP systems. These firewalls usually function by limiting the type of traffic allowed on the calls and closing the session once a call concludes. There are also firewalls that help map unusual patterns and identify signs of an attack. While many VoIP routers have these capabilities, talk to your VoIP provider about their security measures offered. In the digital age, enterprises rely more and more on digital paperwork for business. However, sometimes fax machines, printers and scanners are still used to send and receive data. Fax machines, unfortunately, aren’t compatible with VoIP. This could lead to problems for those who rely on these machines to send information. It’s unlikely you’ll be able to plug your fax machine into your VoIP equipment. You’ll probably need to install compatibility equipment to run a fax machine and other similar devices through your VoIP phone. Equipment varies among providers. But many will offer bridging components (like a fax bridge) to help you send and receive digital information. Many security systems require an Internet connection these days. However, you’ll want to ensure yours is compatible with your VoIP phone service. If the security system isn’t compatible, it can cause issues with both the security system itself and your VoIP service. You may need to check with your VoIP service provider about compatibility with certain security systems, but you can learn more about how it works here. If you hit a dead end with the above issues, it may be time to call for help. Since VoIP calling relies on Internet service and VoIP service providers, sometimes the problem is simply out of your hands. 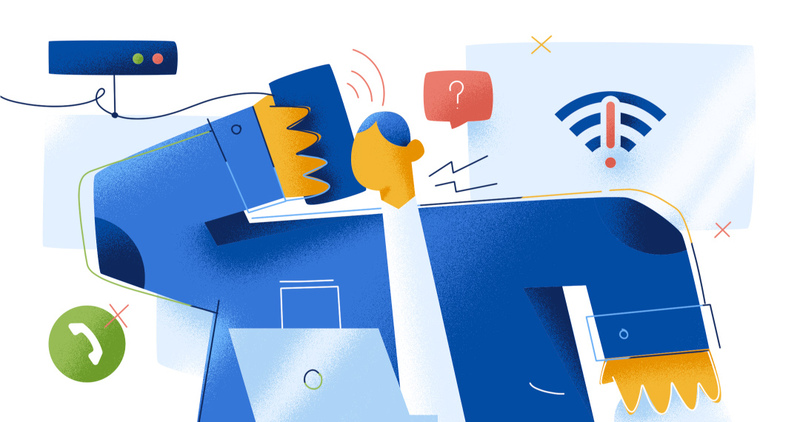 If your Internet is down or you’re having connectivity issues when trying to surf the web, send an email or watch videos, you’ll have to contact your ISP. If you are unable to connect to the internet there is no way for your VoIP service to work, so you must fix this issue first. Also, if you notice issues with your VoIP equipment or call connectivity, it’s a better idea to call your VoIP service provider. They can help you troubleshoot any issues. There are likely more advanced problems than those explained here. Basic VoIP troubleshooting is a great way to fix common problems on your own without contacting your Internet or VoIP providers. It can help you determine where the problem is, what equipment it involves and whether or not it’s a serious issue. After you’ve checked all your cables, reconnected your phones and power cycled all your equipment with no success, your VoIP provider may need to come take a look. This is why it’s important to work with a VoIP provider that ensures excellent customer service. If you work with a knowledgeable and trustworthy company, you should be back up and running in no time.